November and December are months when families get together and share wonderful experiences. Food tends to be the focus of these events. Many times we come away from the events realizing we ate foods that were not necessarily healthy. We stand on the scale and are shocked at the results. Be brave and try some vegan/vegetarian holiday foods!! ​Green Bean Casserole is a popular dish. There is a redo of that recipe under August--Green Beans. Also try the baked sweet potatoes in coconut oil under January 2015. Check it out. Mix the softened cream cheese, pumpkin and sugar until smooth. Add the spices and vanilla and mix well. Use on apple slices, bagel bits, or crackers. In a food processor, combine chickpeas, cilantro, garlic, and avocado. Process until finely chopped. With machine running, add olive oil in a slow, steady stream, then add lemon juice, and then add water, 1 Tbsp at a time, until mixture is smooth. Season to taste with salt and pepper. Serve with lemon wedges and tortilla chips. In a small bowl, combine the cream cheese, feta cheese and onions. Stir in cranberries. Spread about 12 cup mixture over each tortilla and roll up tightly. Wrap with plastic wrap and refrigerate for at least 1 hour. Cut each roll-up into 10 slices. Yield: 40 appetizers. Stir pistachios and thyme into garbanzo mixture. Bake until beans and pistachios are crunchy, about 12 minutes. Transfer mixture to bowl and serve warm. Fill a pot with enough water to cover potatoes. Boil potatoes for 30 minutes, Drain, cool, peel and set aside. Heat olive oil in skillet. Add sliced fennel, onion, ½ tsp salt and white pepper. Saute slowly until golden brown and caramelized, then remove from heat. Drain the water from soaking cashews. Blend cashews, water, garlic, salt and lemon zest in a blender until creamy. Layer one half of the potatoes so they are slightly overlapping in a 9 X 13 inch pan, then top with fennel-onion mixture and spread evenly. Place apple slices on top of fennel-onion mixture. In a skillet, heat olive oil and add minced garlic. Remove from heat when lightly browned and add breadcrumbs and salt. Mix well. This sounds complicated but actually is easy. My family loved this dish at Thanksgiving dinner! Wash and trim ends from the Brussels sprouts. Bring 8 cups of water with 1 Tbsp salt to a boil. Thinly slice Brussels sprouts by hand or by food processor after cooled. In a blender, puree 1/4 cup oil with the shallot. Then pour into bowl and whisk in the rest of the ingredients (except nuts). 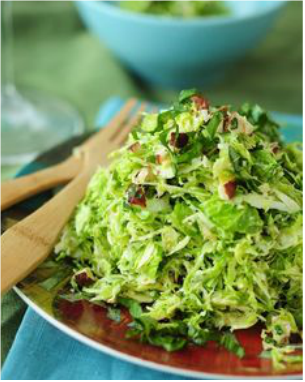 Toss dressing with sliced Brussels sprouts and top with toasted hazelnuts or macadamia nuts. Melt butter (coconut oil) into a fry pan and add celery, onion and links. Cook until onions are translucent. Add to the stuffing. Place all ingredients in blender and blend on high for about 2 minutes until smooth. When the mixture is so smooth that no graininess is felt in a drop of it between your thumb and finger, pour into a saucepan. Bring to a boil, stirring constantly as it thickens to keep at from lumping. As soon as it thickens, remove from heat and serve. Saute the mushrooms, walnuts, and onions in the olive oil for 4-5 minutes. Add the vegetable stock and simmer until the walnuts are tender, about 10 minutes. Preheat oven to 350 F. Place cranberries on a small baking sheet & roast for about 15 minutes. Warm oil in a fry pan over medium-low heat; add onion and garlic. Cook until onions are translucent, about 5 minutes. Add carrot, celery and cook for 5 minutes. Add apple and Italian seasoning, and cook for about 3 minutes. In a large mixing bowl, combine squash, cooked veggies, black beans, quinoa, walnuts, egg, breadcrumbs and salt. Mix with hands until well combined. Transfer mixture to a parchment lined 9X5 inch loaf pan, smoothing out with a spatula to remove air bubbles. Prepare the cranberry glaze: Puree the roasted cranberries,ketchup, brown sugar, Sriracha sauce and garlic until smooth. Spoon cranberry glaze over top of loaf until fully covered. Bake the loaf for 45 minutes. Remove from oven and let cool for 5 minutes before removing from pan. Meatloaf: Preheat oven to 350 F. Lightly coat a 9X5 loaf pan with cooking spray. Pulse mushrooms, onion, garlic, and spices in a food processor, scraping down sides as needed, until coarsely chopped. 30-45 seconds. Transfer to a large bowl. Heat oil in a large skillet over medium-high. Add half of the mushroom mixture and cook, stirring occasionally, until the edges begin to crisp, about 5 minutes. Transfer to another large bowl; repeat with remaining mushroom mixture. Meanwhile, pulse chickpeas in food processor until coarsely chopped; add to bowl with cooked mushroom mixture. Add egg, chickpea flour, cilantro, parsley, and salt and gently stir to combine, being careful not to mash mixture too much. Spoon mixture into prepared loaf pan and bake until edges are browned and center is completely set, 75-90 minutes. Transfer pan to a wire rack and let cool 30 minutes, then invert onto a cutting board. Tahini Sauce: While meatloaf cools, puree garlic, tahini, lemon juice, salt and ½ cup water in food processor until very smooth. Slice meatloaf into 2” pieces and transfer to a platter. Top with Tahini Sauce, pomegranate seeds, mint and parsley. Loaf can be made 3 days ahead; Tahini Sauce can be made 1 day ahead. Keep both chilled. Heat 2 Tbsp butter in skillet and saute for 1-2 minutes on each side. Arrange sauteed pears on bottom of baking dish. Pour cranberries evenly over top of pears and make sure to fill the gaps between pear slices with cranberries. Puree the rest of the ingredients in a blender. Mix liquid into dry ingredients and spoon batter evenly over parts. Meanwhile, make the crumble by adding all the crumble ingredients, except the oil and mix together. Add the oil, a tablespoon at a time, until the mixture begins to clump together.